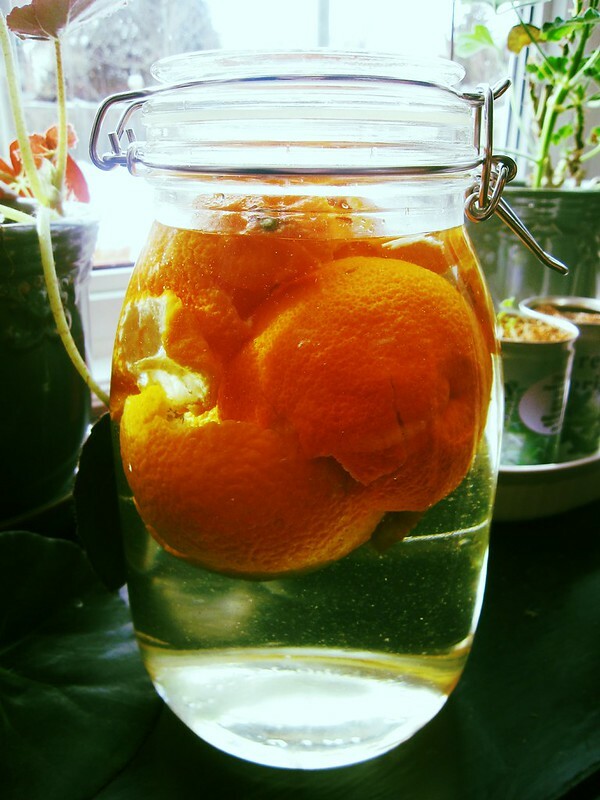 citrus-infused vinegar | i made it so. i’ve placed some citrus peels in vinegar. this vinegar is intended for cleaning around the house, which seems like a lot of work, but i really dislike the smell of vinegar. especially when i use it in a spray bottle and the tiny particles float around in the air. in the past, i’ve tried adding essential oils like tea tree and lavender to cut through the sharp vinegar smell. that works great, but essential oils are not inexpensive, and since the vinegar will mostly just go down the drain, i thought i’d try orange peels and see how that works. i filled up a jar with vinegar and added orange and clementine peels to it. i’ve read that you can leave it for a few weeks, shake it up once in a while, and the citrus oils eventually come out of the peels. if it all works out, this should act as a degreaser with a fresh citrus scent. let’s see if it works. anyone tried this yet? let me know how you use vinegar. This entry was posted in around the house, Uncategorized and tagged citrus infused vinegar, vinegar for cleaning. Bookmark the permalink. No, I have never tried that. You would probably hate me because I buy all of my cleaning products right at the Home Depot… I wish I was cooler like you and tried to make things myself. I have always admired people that do. Good luck! Fun experiment. :) I use vinegar for hard water stains and deposits. i’ve had some experiments go wrong, as you know, but i am fairly confident that this won’t be too disastrous. oh i’m so curious to hear the results! what a neat idea. I do a mix: vinegar and some doc brenners…sometimes a squeeze of blue dawn for kicks…if i have it . Throw in some peels (the kids think its great fun) and top off with water . Its in a large spray bottle, and its my go-to all purpose cleaner. Nothing gets my granite counters shinier.